[値下げ] Animated PNG&GIF Editor | Mac App Storeのアプリ検索・ランキング BuzzMac! 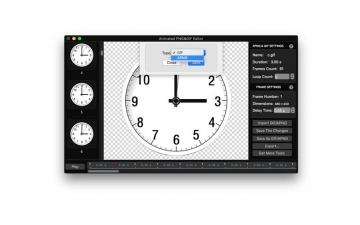 "Animated PNG&GIF Editor" can preview, edit, delete, replace, insert, extract the frames of APNG and GIF. 1. Preview APNG and GIF animations. 2. Display APNG and GIF frames properties. ~Name: APNG and GIF Name. ~Frame Count: The number of animation frames. ~Loop Count: The number of times to repeat an animated sequence. A value of 0 means the animation repeats forever. ~Frame Number: The index of animated sequences. ~Dimensions: Size of the picture. ~Delay Time: The amount of time, in seconds, to wait before displaying the next image in an animated sequence. 7. Replace the picture of the frame. 10. Extract the pictures of APNG and GIF. APNG is an extension of the PNG format, adding support for animated images. It is intended to be a replacement for simple animated images that have traditionally used the GIF format, while adding support for 24-bit images and 8-bit transparency. APNG is a simpler alternative to MNG, providing a spec suitable for the most common usage of animated images on the Internet. APNG is backwards-compatible with PNG; any PNG decoder should be able to ignore the APNG-specific chunks and display a single image.